Last night I watched the first episode of the revived “Cosmos,” the legendary television science series created by charismatic astronomer Carl Sagan. Sagan was less known for his scientific achievements than for his amazing ability to make science comprehensible, and even entertaining, to audiences not normally interested in hard-to-grasp facts and theories. In 1980 when the series first aired on PBS, computers were only beginning to infiltrate every aspect of our lives. Geeks and nerds hadn’t yet ascended on the social/cultural evolutionary scale. “Cosmos” helped to glamorize the pursuit of knowledge at a time when stunning photographs of the vastness of outer space were first being sent back by the Voyager satellites. Such images let us see with our own eyes how very small our little planet is in the Big Picture. The world has changed a bit since those starry-eyed times. Some things have improved. Others seem to be regressing. In our current era of “reality” television, widespread conspiracy theories and muddy thinking, irrationality appears to be gaining ground. It’s a bit disheartening. But at least now we have astrophysicist Neil de Grasse Tyson, who hosts the new series, to rev the engines of hope and wonder and science. He’s the right man, on the right planet, at a critical time. I’ll admit, I never watched much of the original “Cosmos” series in 1980. I had just given birth to my first child and was expecting a second. My world was very tightly focused. But I had a cursory grasp of the basics of “Cosmos.” An infinite universe? Check. Evolution? Check. Room for improvement in the human interface with our beautiful planet Earth? Of course! In the years since then I’ve had to cash in a few reality checks. Apparently not everyone fully accepts the fact-based discoveries learned through centuries of science. Though brave thinkers died for this knowledge, and the discoveries they made have improved life, at least for humans, immeasurably, this reality seems not to count for much with the crazy crowd. I understand crazy. Been there, done that. I prefer science. It’s more exciting, more fascinating, and far, far more hopeful. Last week on a trip to the west coast of Florida I visited a nature preserve on Honeymoon Island State Park. The park aims to encourage native wildlife, as opposed to the sort of human wild life that thrives across the causeway, where bars and restaurants and gift shops cater to tourists and kids on spring break. 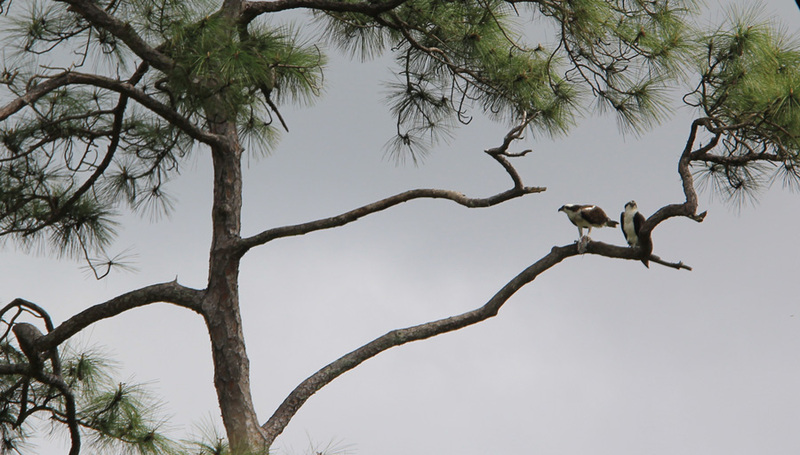 Honeymoon Island caters to ospreys. Eagles too, and also rattlesnakes, in addition to some snuffling armadillos and camera-shy turtles. It’s quiet in the park. The high-pitched shrieks of nesting ospreys carry on the wind. The nests are easy to see, a hundred feet or more above the ground. You can see why the birds thrive there. The surrounding waters provide a steady supply of fish, and there aren’t any predators. A perfect place to raise offspring. If you look at Earth objectively, from a scientific point of view, our little planet has all the fixin’s for the human species to raise its offspring. Yet we continue to be our own worst enemies, with whole generations killing each other off, century after century, as if there were no tomorrow. If we keep it up, perhaps there won’t be. For us. That’s why shows like “Cosmos” are so important. News broadcasts may keep us aware of some of the dangers we face, and other forms of entertainment may divert us from facing those problems, but “Cosmos” urges us to open our eyes and our minds and reflect upon how magnificent and breathtaking is the universe in which we live. The show, which is airing on Fox (!) on Sundays for the next 12 weeks, will be repeated Mondays (tonight at 10 p.m.) on the National Geographic Channel. Catch it if you can. 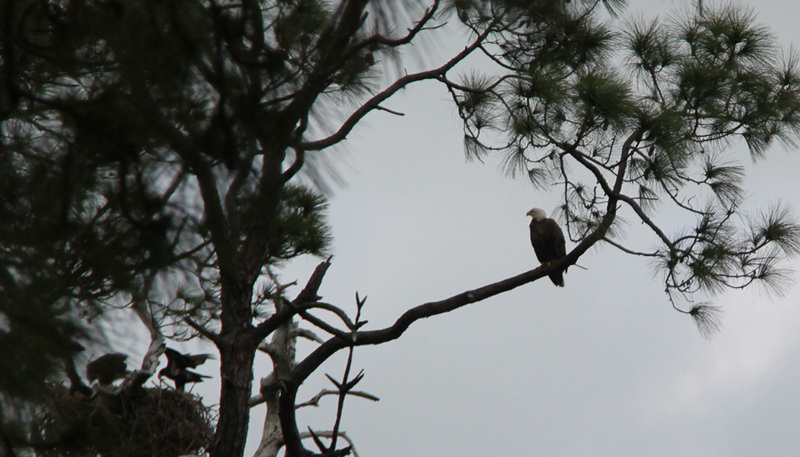 Mom eagle keeps a watchful eye on the youngsters while Dad’s out catching dinner.